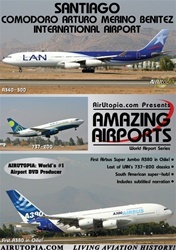 Santiago International Airport - First Airbus A380 Super Jumbo in Chile! 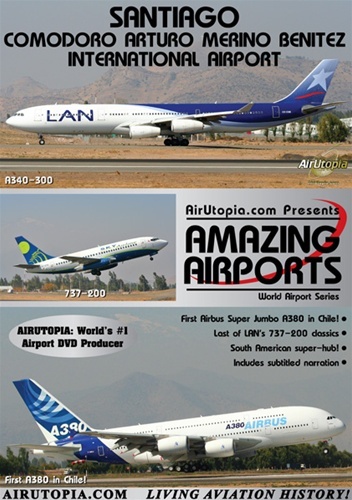 AirUtopia welcomes you to Santiago International Airport for a truly amazing South American aviation experience including the first ever arrival of the Airbus A380 Super Jumbo on Chilean soil! Aircraft included - the last of LAN’s 737-200s, PLUNA CRJ-900, Air Comet 737-200, Varig 767-200, Sky 737-200 and many international airlines from around the world! First Airbus Super Jumbo A380 in Chile! Run time is about 75 minutes. Format is NTSC DVD and region-free. To play video trailer, click on the Play button. Copyright © 2006-2018 Aeroclipper Video. All Rights Reserved.